Building A Cash Flow Model for Excel course shows you how build a Cash Flow Valuation Model using Excel and Yahoo! Finance data. You are taught in detail how to build a Discounted Cash Flow Model using Yahoo! Finance fundamental stock data. The course also shows how to import cash flow data automatically into Excel from Yahoo! Finance using a Web Query. 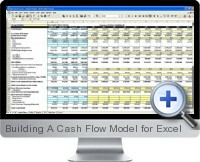 Building A Cash Flow Model for Excel course is delivered in HTML format for easy viewing on a web browser, and includes all formulas, worksheet structures, screen shots, images, and in-depth financial descriptions behind every component to enable you to model and value a public company's cash flows. This model can be used for any public company available on Yahoo! Finance and any currency. A Course showing how to build and operate the model with further Resources to do subsequent research. Detailed instructions on building the Discounted Cash Flow Model in in Excel. Instructions on how to import Cash Flow data from Yahoo! Finance into Excel automatically. Lifelong access to the course materials. Learn to integrate Excel and Yahoo! Finance automatically into a highly useful public company valuation tool. Acquire unique knowledge for any Excel modeling project. Save money by eliminating data costs - replicate the model to enable valuation of multiple stocks at once. Automatically import quarterly Cash Flow Statement, Income Statement and Balance Sheet data directly from Yahoo! Finance. Find out about other key resources for extending the model, calculating discount factors, valuing companies, increasing your Excel knowledge, and accessing other free Excel tools on the Internet.